A friend of mine challenged me to boot TC via the crappiest PC he could find. Wait, I thought you just said 64M of RAM ? Does the X server even run ? Seriously, don't you see the picture above? How about compiling some stuffs ? 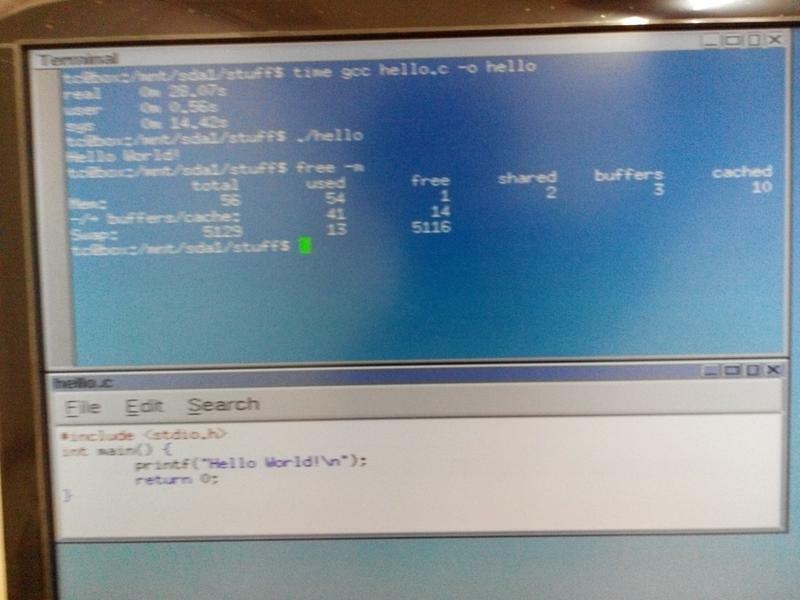 Let's do a simple "Hello World!" Elapsed time: 30 seconds just for a line of Hello World! Memory usage please refer to the image. Is there anything else you wanna try it out ? I can't tell if you used it but try nozswap in the APPEND line. That should free up a little more RAM. could go for something in the 800 x 600 range? to a couple of rescaled pictures I'll edit the post for you. I don't have that code, will try it. Adjusted, I think it's OK now. I edit the file on imgur, I believe it should be fine since the forum links to them. BTW, USB audio card totally works with alsa on this machine. In fact, the music plays smoothly. There's no net card around me, I hope it'll work out just like the audio card when I eventually get one. to be of use later on. Actually, the first time I built hello.c, it took only 15 seconds. I forgot to take a picture so I re-run gcc for photographing. Noticing the time had changed, I kept retrying. The more I do, the slower it gets, until it reaches 30 seconds. I believe it's due to the swapping process, the hard drive rattles when I compile. Guess there really isn't enough RAM to cache anything long enough. Or maybe even a NeXT box! etc etc. From that perspective, your machine would be the ultimate dream. I'd hang on to it and stop laughing at it. 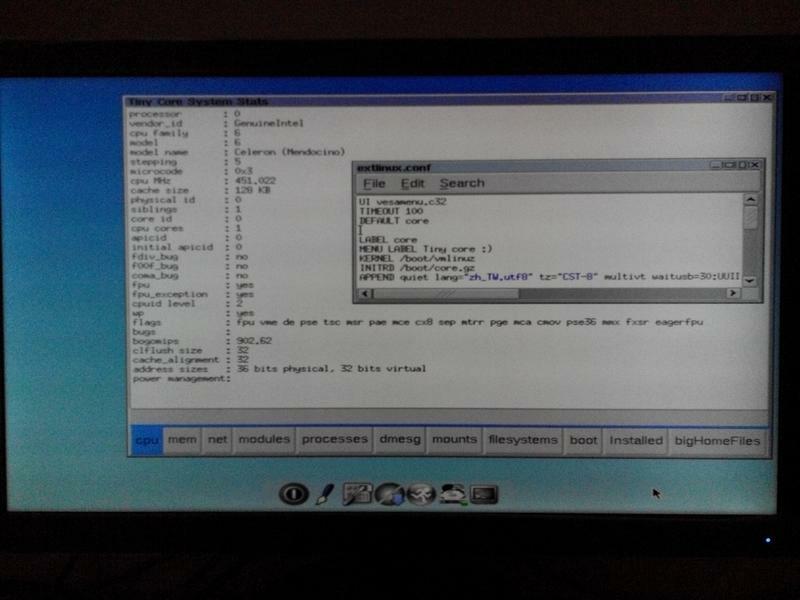 I have a K6-300 I booted it on a few weeks ago so I could clean off the disks before I recycle it. I didn't try the GUI, but downloading hdparm and e2fsprogs was easy enough. The problem with old computers isn't booting an OS, it's POSTing because the CMOS batteries are all dead.